Thanks to Vionic for sponsoring this post! My style and opinions are my own. These shoes are so nice, I had to share them twice, and when we had the most divine taste of spring weather earlier this week, I felt motivated enough to take outfit photos after work. It's funny how when you continually take photos in the same places over the years, you get to notice the nuanced changes of the sunlight at different times of the year. I mention this because the library is a frequent backdrop in my photoshoots, and where I shoot largely depends on the light. In the late afternoon as we reach the tail end of winter, my favorite staircase is just engulfed in light, so much so that I tend to avoid it, not being a fan of direct light. There is a more favorable place, also west facing, but I can shoot with the light behind me. However, what was once a picket fence and trees is presently a construction zone with a new house springing up. I relocated once again, to more northern spot, which looks lush and vibrant in the summer, but presently just feels barren and raw. In a few more months the trees on the eastern side of the building will be in bloom, but right now there isn't much to see. Traipsing around to the front still wasn't quite giving me the light I wanted, as well as having the disadvantage of being the main entrance - ideal for shooting on bank holidays and after hours. I circled again, the sun was setting. I finally spotted a staircase, not as grand or pretty as the others, but secluded and with just enough of the sunlight to get that rim light, and that glow. All I could think was, thank goodness I was shooting my flat, comfortable Vionic mules; in a different shoe, I might have given up before I found my light. The struggle to find the right light is one I can totally identify with. We generally shoot in the early mornings if we can, but that has been next to impossible this winter, with the sun not actually being on the rise until after 8 am and temperatures at that time fo day still being way too low. To be honest, we haven't shot much at all. The photos we have taken have been done mostly in the afternoons, which offer very different light than I'm used to, and I'm still adjusting to the new look of my photos as a result. But I love how these ones turned out for you, the warm light combined with the soft colours in your outfit is just gorgeous. 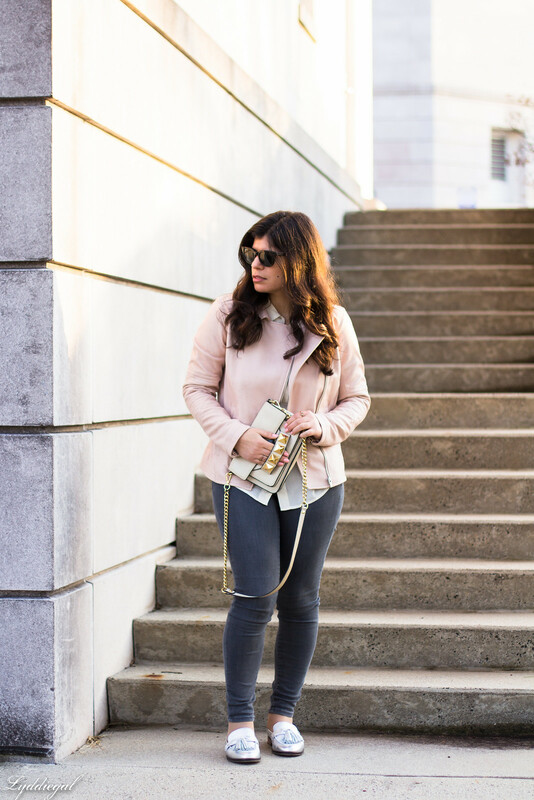 That blush jacket looks gorgeous paired with your mules! These photos turned out so well! They were worth the extra effort and time to find a location! This outfit is just so lovely. 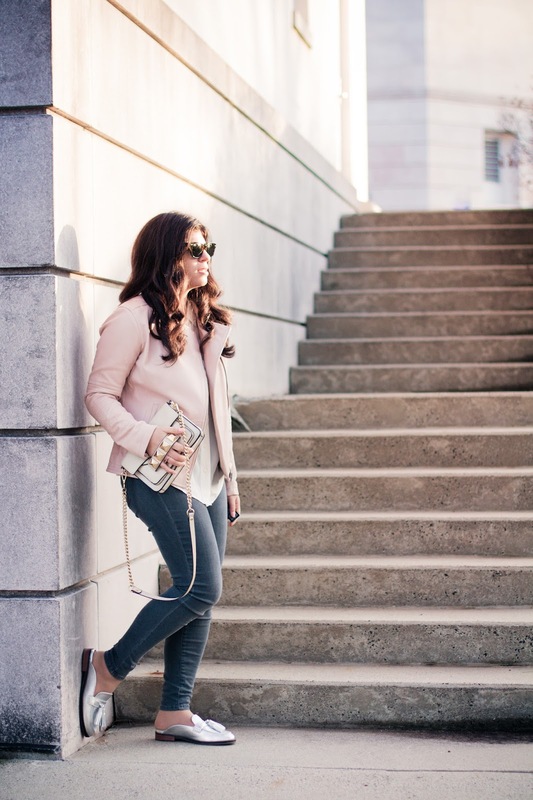 I adore the bag, the blush jacket and the fit of the jeans. And I totally know what you mean about chasing the light when taking photos at your favorite spots. This made for the perfect spot for photos! I love the colors in this look and your pretty silver slides. It's amazing how the light makes all the difference, and what we do to get the best shots!! Those shoes are definitely going to be a favorite...they go with everything, Lydia!! I missed Spring and sun so much. Your outfit reminds me of it! 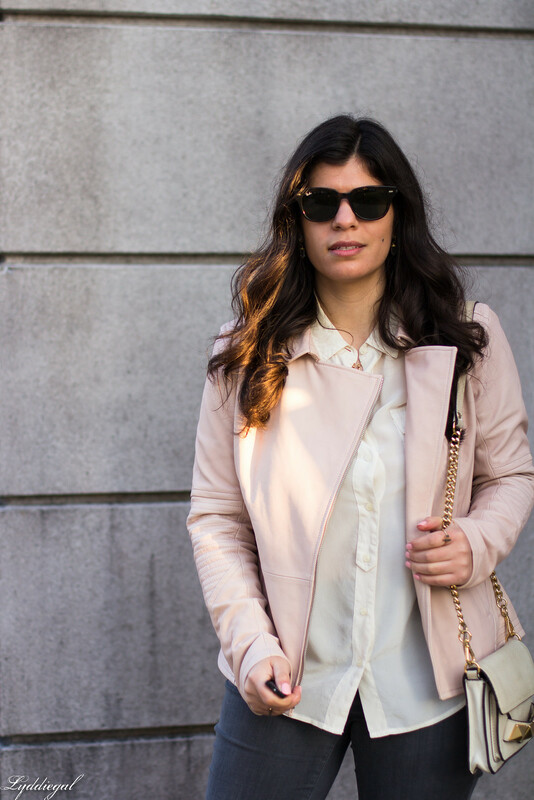 Oh I love the blush pink and grey together! :) I'm struggling with finding the right light at the moment, it's so hard here in summer as direct light is too harsh and I need some shade! I'm just kinda rotating spots based on where the most shade is, haha! Hope you are having a lovely weekend :) Another quiet one here as the long awaited cooler weather brought a ton of rain with it, ha! I'm glad you shared those mules twice. 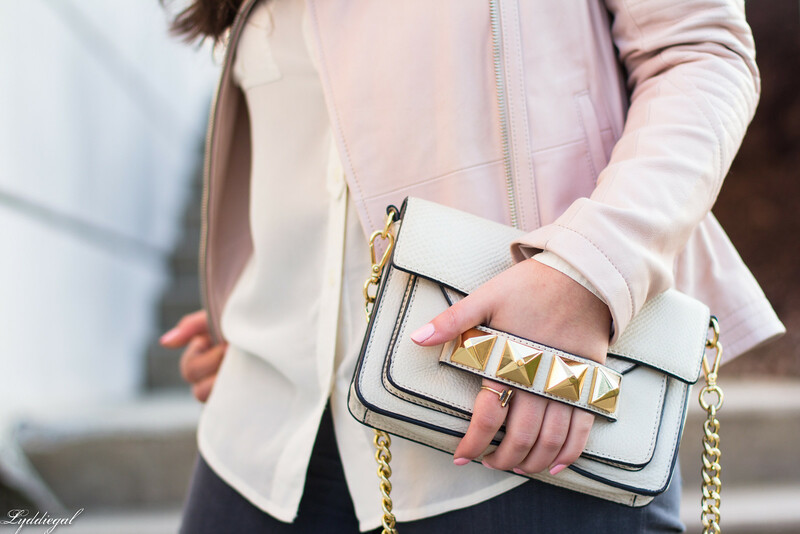 I love them and this firmed up my decision that I will be hunting down something similar for spring this year... they are so fun and versatile! And I think your dedication to good light paid off--these photos turned out great! What a hunt ! It seems like it paid of though, great shots. 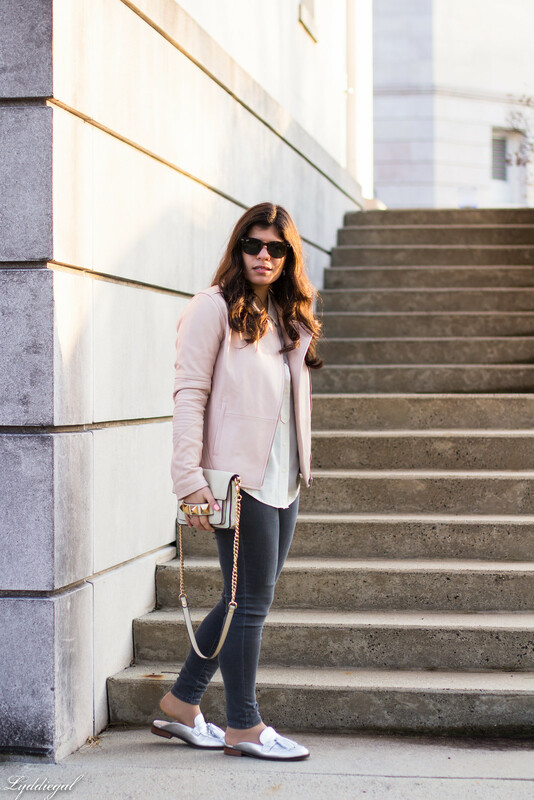 I love the shoes and also the pink leather jacket. In my case, you know, i take a few shots in the parking lot before going into the office or in the afternoon. Its difficult to find secluded areas in the city..
Loving this outfit on you dear! 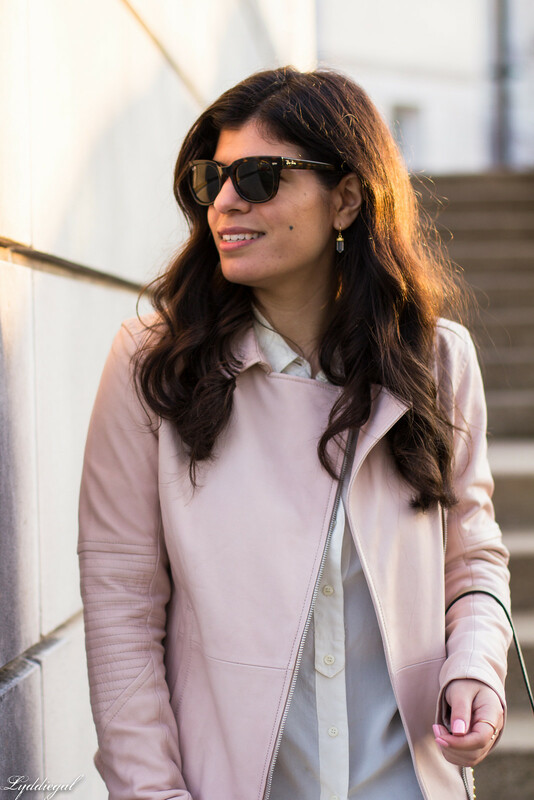 The jacket is simply chic, and love the metallic shoes. The gold details of the black is really elegant too.